As the days become chillier and morning autumn mists cover the countryside our fields and verges appear covered with spiders-webs, damp air beading like jewels that sparkle between the dessicated, dry grasses and field plants of summer. It is also the time of year when spiders enter our houses, causing the panicked raising of feet as they run across the carpet and a dash for a glass by the brave (me in our house) to remove the hairy monster. This autumn, as part of Biology Week 2013, The Society of Biology have decided to bring a focus of understanding to this autumn influx and are particular interested in the movements of the Tegenaria species – our classic house spider. Tegenaria typically live in dry places around our gardens – in the wood pile or tucked away in the dark corners of our garden sheds. At this time of year the females are setting up nests in these nooks and crannies ready for the winter and the males enter into our houses in search of them. 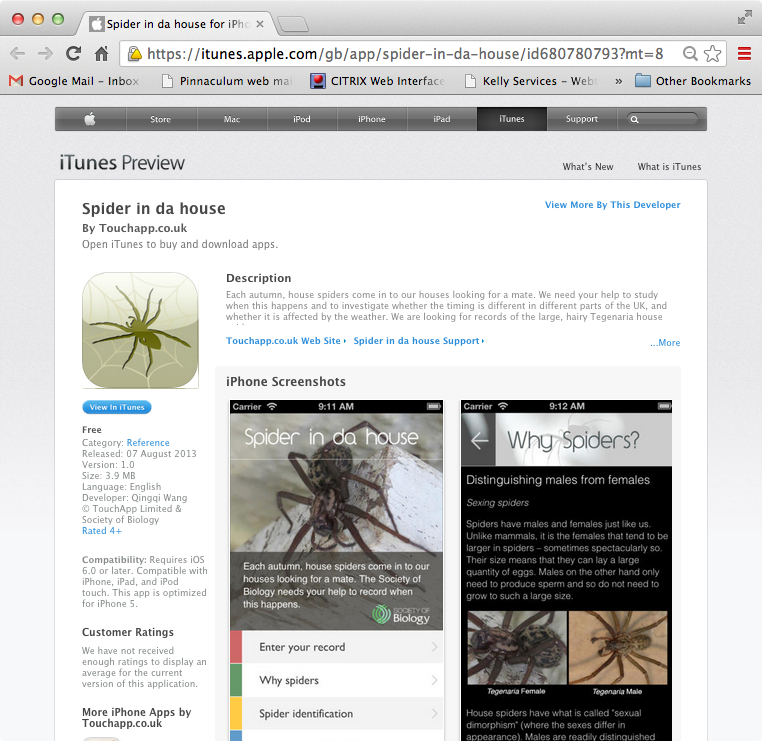 The project website seeks to educate on this seasonal migration and provides general information on some of the 650 species of UK spider and a guide to the main genus encountered around the house. They have also develop an app, available for Apple or Android phones that lets users record the sightings and photos of Tegenaria and submit them to their website. There is also an online recording page too. The app would have been handy a few nights ago when a ‘biggun’ made a late night sojourn across the living room. Today, a hunt round the house unearthed this delicate specimen. According to the app, Pholicidae spiders have small bodies and long legs and have untidy webs behind sofas and in the corners of rooms. There are two species that live in our homes; Pholicidae Pholcus has a long, thin abdomen, whilst Pholidae Psilocorus is rounder and plumper, making the specimen I found a Pholcus. Their webs may insubstantial and flimsy, but apparently no less effective. 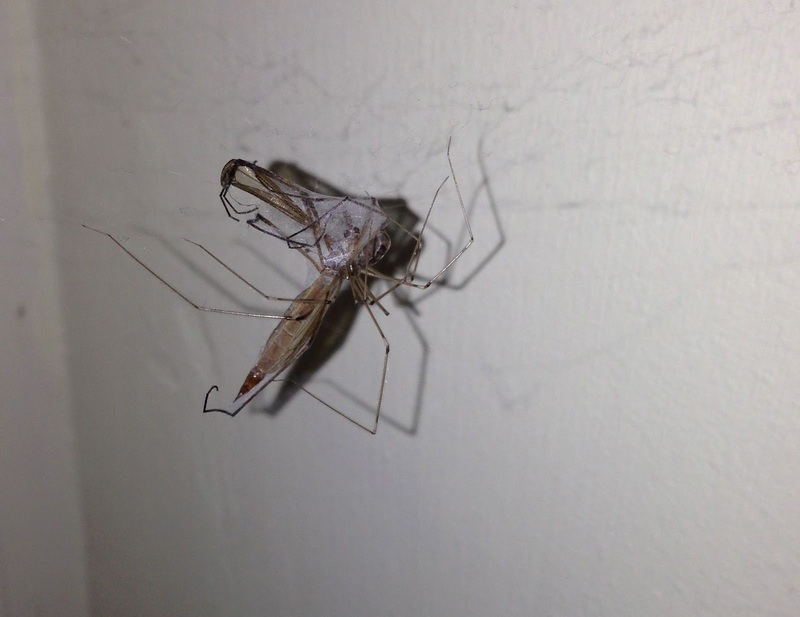 Our pholcus has snared a Daddy Long Legs and is currently tucking into Sunday dinner! 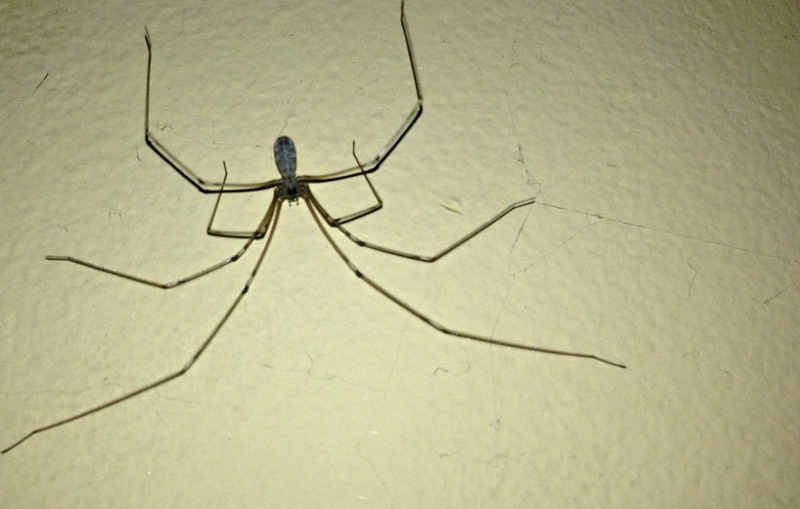 Daddy Long Legs, Pholicidae Pholcus, Society of Biology, Spider, Tegenaria sp. Bookmark. I think Pholcidae is the name for the family (genus) of spiders whose 'first name' is Pholcus.